Last night I attended the South African launch of the Fuji 2011 line up. I wont go into many of the details of the cameras as we have covered them when they were announced worldwide earlier this year. What I would like to do is highlight the models that grabbed my attention and why. 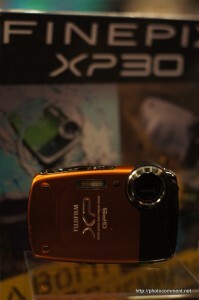 This model is hailed by Fuji as the first waterproof camera with GPS and its about time. I would have thought manufactures would know that people buying this camera are more likely to want the GPS than the consumers for some of the other cameras that have had this feature. I was told last night, though I have not yet confirmed this, that Fuji’s software has something like 30,000 places of interest mapped into the software based upon GPS co-ordinates for easy tagging. This camera sports 14MP, a 5x optical zoom and the GPS. It is also waterproof to 5m, shockproof from 1.5m, freezeproof to -10C and dustproof. Many that know me know that I have not been a big advocate for these big zoom, hybrid like cameras. I began to change my view on them when I started to see what people were getting out of the S-series of Fuji cameras and then the HS10. With the HS20 things seem to be even better. I has a 16MP BSI (Backside Illuminated – not a persons bottom note, its the Backside of the sensor) CMOS sensor. I have been very impressed with the results from BSI sensors so I cannot wait to test this one. 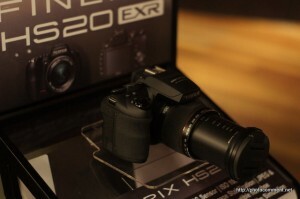 It has a whopping 30x optical zoom and being lighter than your average DSLR with zoom reach which would cost a fortune I see the benefits of the HS20. This one really starts to turn my opinion on ‘hybrids are junk’. I also got to spend some time with the X100 that seems to be taking the world by storm, but I will post my first impressions on that a little later today or tomorrow.